Ha Long Bay is situated in north Vietnam round a 120 kilometer long coast line and is literally translated as “Bay of Descending Dragons”. The top tourist attraction in Vietnam, Ha Long Bay features thousands of islands, each topped with thick jungle vegetation, forming a spectacular seascape of limestone pillars. Several of the islands are hollow, with enormous caves, others islands include lakes and some support floating villages of fishermen. 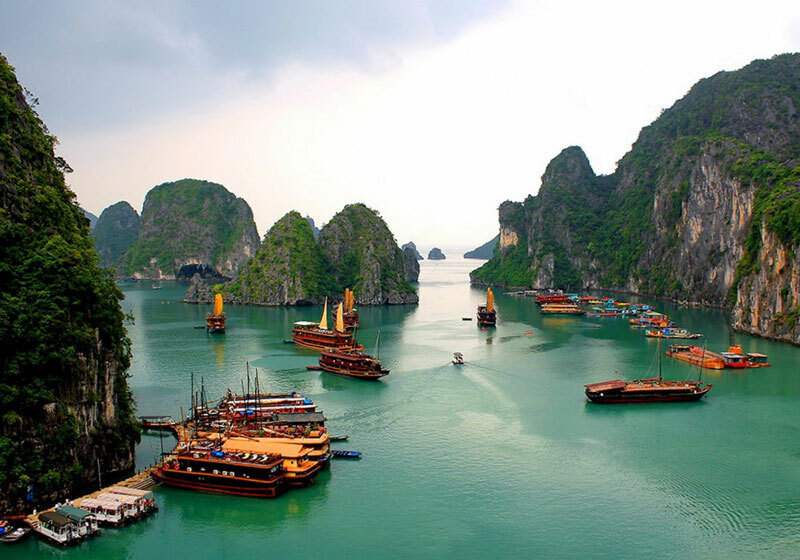 Short Description: Hạ Long Bay, in northeast Vietnam, is known for its emerald waters and thousands of towering limestone islands topped by rainforests. Junk boat tours and sea kayak expeditions take visitors past islands named for their shapes, including Stone Dog and Teapot islets. The region is popular for scuba diving, rock climbing and hiking, particularly in mountainous Cát Bà National Park.